Introducing "Tragic 8 Ball". The first ever professional decision making app for the Apple Watch ... and indecisive people. 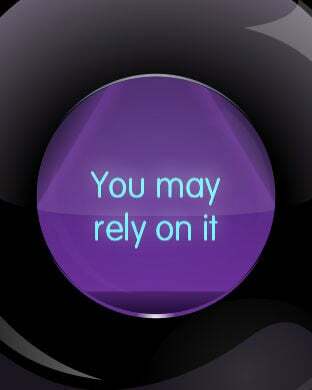 Consult the ball for answers to any yes/no question. It works on the Apple Watch and iPhone and it is completely free. Here's how it works. Pay attention now. It's pretty tricky. You ask a question like... "What email program should I use?" You give your phone a shake or tap your watch ... and the answer is ... "Outlook not good". Mmm helpful! Hang on. That's not right. Yes/no questions only! Once you get an answer, if your friends don't believe you, hit the share button. The app takes a screenshot of your question and the answer and you can share via email, SMS, Facebook or Twitter. Researchers at Cornell University found that people make an average of 226.7 decisions about food and drink alone. Talk about decision fatigue! Looks like everyone needs this app. The app is telling us it's time to have a beer. Got to go. We really hope you enjoy the app!